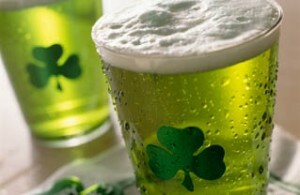 St. Patrick’s day is one of my favorite holidays. No…no..no not because you can drink. Who needs a holiday for that when you can do that anytime. 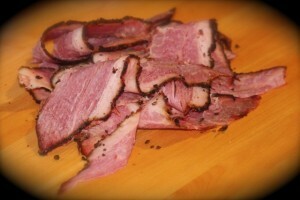 For me St. Patrick’s day is about the corned beef. This time of year is when it gets super cheap and I buy quite a few to make pastrami. I usually prefer the points. 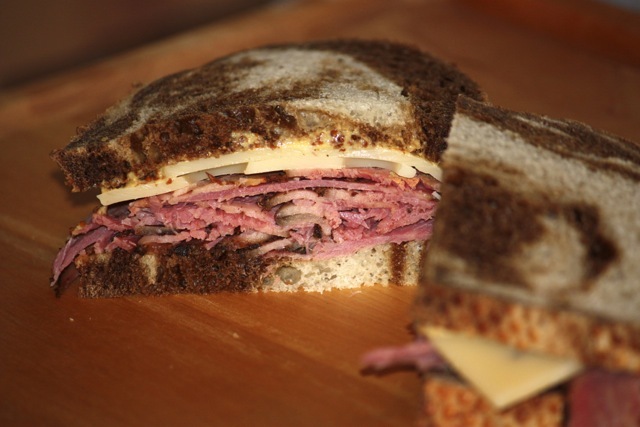 Pastrami is traditionally brined and coated with spices. 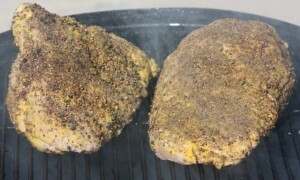 Corned beef is brined too but not usually covered with spices. This is a pretty simple and straight forward process. First thing is throw that damn spice packet away. I have an aversion to spice packets included with food. I think that there is dead cat chunks leftover from the glue factory in them. 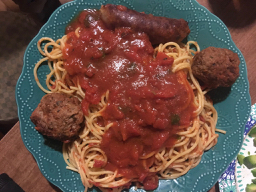 I will admit the spices included here probably are o.k. but I’ll err on the safe side. Give them to your mother-in-law. Anyway….you need to soak them in water for 2 days completely submerged. Change the water 4 times (if you only do it twice I won’t tell). This is to reduce the salt. After two days your ready to rock and roll. Squirt some cheap a$$ mustard® (yes I said cheap a$$ save the good stuff for later) and rub all around. This doesn’t really do anything I just want you to get mustard all over your hands. Well actually it is going to hold the spices on okay? Sprinkle both sides with granulated garlic. Now in your spice grinder (you have one right?) you need a 2/1 ratio of black peppercorns and whole coriander. 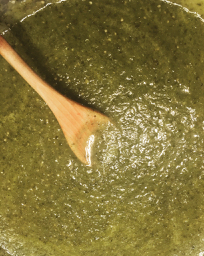 For the sizes I was doing I used 2 tablespoons pepper to 1 tablespoon coriander for each one (I did two). You want to cover it all over pretty good. 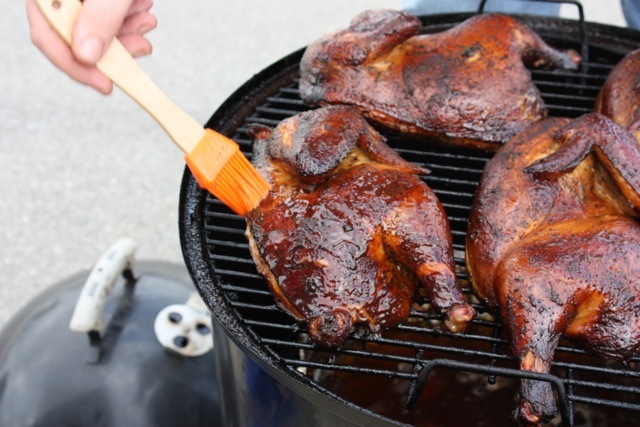 Toss on your smoker. I have a small Weber Smokey Mountain that I like to use for smaller things. 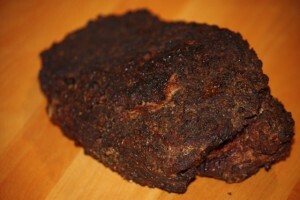 The cut I used was the point (thick end of the brisket) and had on the smoker about 12 hours. I used hickory but I’m sure you can use whatever wood is your preference. Mine shrunk almost in half! But it’s worth it trust me. I wrapped in foil and stuck in the fridge until the next day. 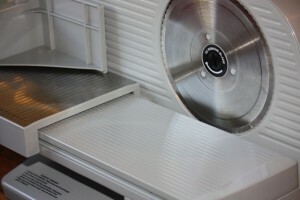 Now that it is chilled it is slicing time! 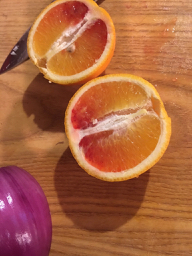 Yes you can use a knife but I finally found a reason to buy a slicer! The two I made was enough to fill up a 1lb ziplock bag of sliced goodness. Now we need to get down to business here because I’m getting hungry! Get yourself a nice loaf of crusty marble rye and some creole mustard. 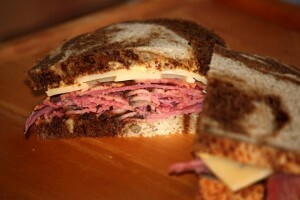 Pile on the pastrami and add some swiss cheese. Okay quick story. When I was a kid I never liked cheese at all. None. Nada. Zip. I would gag on macaroni and cheese. The only exception was Swiss cheese on pastrami. I was a weird kid I guess. And finally the end result that now is in my belly. There are many ways to make a pastrami sandwich and the best I ever had was just a hunk warm pastrami on a roll with some au jus. I had that 30 years ago and to this day I still remember it. If you have any questions about this let me know. Send your photos too! 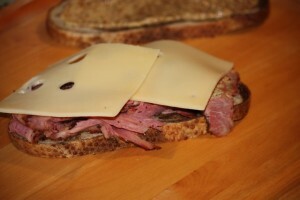 A cheap and easy way to make your own pastrami that is far superior to what you can get in the store. 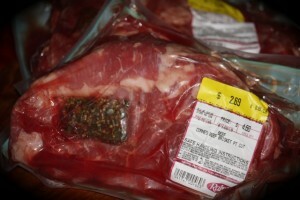 Remove corn beef from package and toss spice packet. 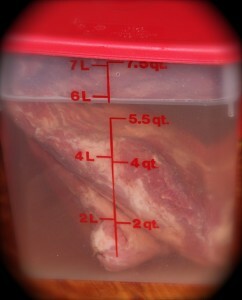 Soak corned beef in water submerged and covered in refrigerator for 2 days changing water 4 times. After 2 days remove from water and rinse and pat dry corned beef. 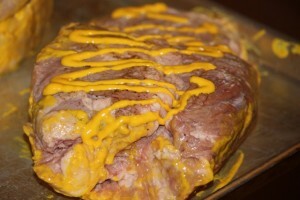 Rub the cheap a$$ mustard® on each piece of corned beef and sprinkle with granulated garlic on all sides. Grind the pepper corns and coriander together. If all won't fit in your grinder do in batches and mix together. Divide in half and sprinkle each half over corned beef. 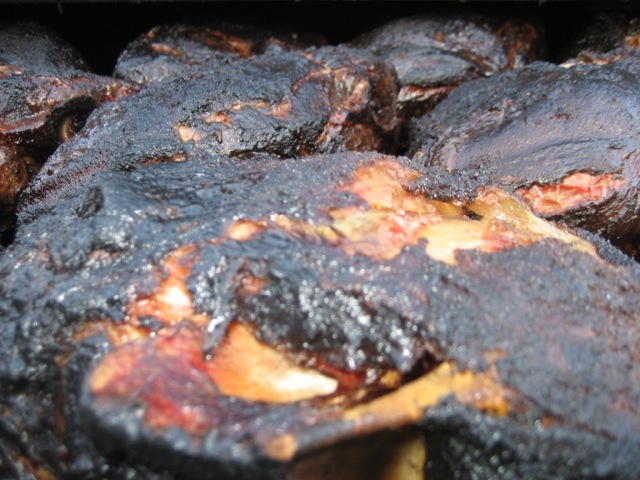 Smoke at 225 with your favorite wood (I used hickory) for 10-12 hours or until they have reduced in half. Let cool and wrap. Place in fridge overnight. 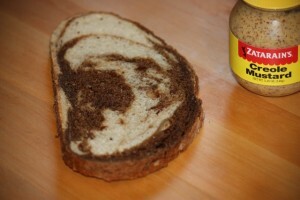 Slice and add some Creole mustard and Swiss cheese to some Crusty rye bread and enjoy! 2 Responses to "Hot Damn Pastrami!" LMAO about the spice packet. My wife and I were arguing about our pastrami Friday. 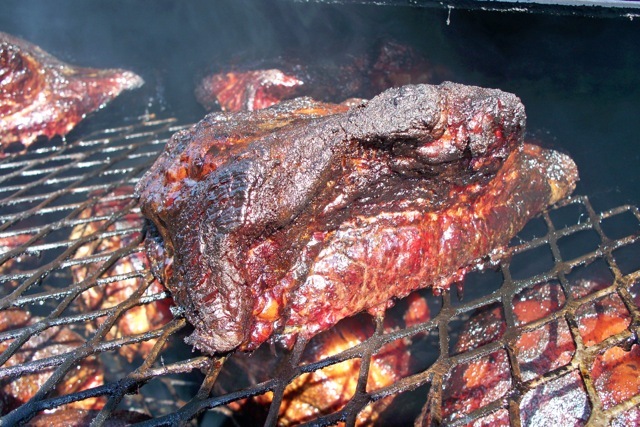 I wanted to buy a fresh brisket and corn it myself before smoking. She wanted to get the corned beef. She won of course. Yeah they have a way of winning most of the time. I think they brainwash us when we are sleeping!